This mining I got up at 6:30am for the first time since Byron! When Mark went to work in Coloundra he dropped me off at Moffat Beach, so I could go surfing. He would then pick me up again at about 11:30am, on his way home, as he was working from home in the afternoon. As I jumped out the car at Moffat I could see the surf breaking over the reef/point on the right hand side of the beach, and it looked huge! I quickly pulled my wetsuit on and hit my bag in the rocks at the top of the beach, then tried to decide how/where to get in - people were walking along the reef and jumping off straight into the lineup, or you could paddle round from the beach. After my last experience I decided to play it safe and just paddled round from the beach, although it did take 10-15 mins of constant paddling over Atleast 300-400m. Once I got into the line out it was a solid 5-6ft, with some bigger sets coming in too. However most of them weren't top to bottom barreling (other than one section), more just crumbling and peeling down the reef. In the 2 and a bit hours I surfed for I can only have caught about 5-10 waves, but a couple of them were probably the longest rides of my life. My foot was feeling better, but not right, and I felt really rusty, but I had a lot of fun. At one point I was sat on the barreling section when a ripper on a longboard came down the reef shredding this wave for all it was worth. When he got to where I was sat he tucked in the barrel and for a moment disapeared behind the certain, then re-appeared heading for the exit. I ducked dived the wave hoping he made it out, and sat waiting. All of a sudden he bobbed up near me and screamed 'far out!!'. Turns out he just got clipped and knocked off as he was getting out the tube, and was handed some time on the reef. I eventually had to get out as my paddle fitness wasn't up to the task, and the surf was going to crap anyway, so it was probably good timing. Instead I just my board of the beach and was bodysurfing the barreling shore break onto the sand. After a while that got boring too so I got out and changed, got a couple of snacks from the shop and sunbathed in the beautiful sunshine on the beach until Mark arrived to pick me up. 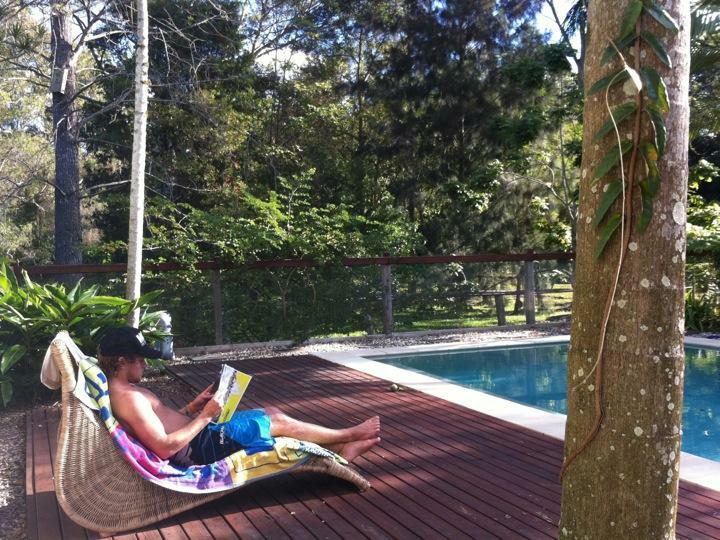 When we got back I got a lounger chair and just sunbathed by the pool reading my surf magazine. Before he had any more patients Mark added me to the insurance to the car he and Fenella bought for Fenella's mum!! I questioned him into if he was sure about wanting to do it, but apparently they had discussed it and wanted me to have the freedom. As you'd expect I was over the moon! Fenella's mum leaves in a week, so I will have it to use then to get to and from work etc! For the rest of the afternoon I just sat around by the pool and helped out with bits and pieces around the house, and just generally chilled. I went to football training, for the first time with the Seniors at the same club that Diggor and Cesily play for. I wasn't half as unfit as I expected and could keep up with everyone easily enough. There was lots of banter and I had a really good time. I struggled with my foot stopping and trying to turn quickly though, so I will wait until my foot heals until I go again. It was $200 to sign on to play games too, so although it would be fun I won't be signing on, but will probably just train instead. When I got back I had dinner and chatted with the family, then went off ink the study to Skype home. I had an in depth conversation about what I am going to do about my flights, and when I am going to come home etc. It was really nice to catch up again and find out what everyone is up to. I then went to bed after about 11:30pm..